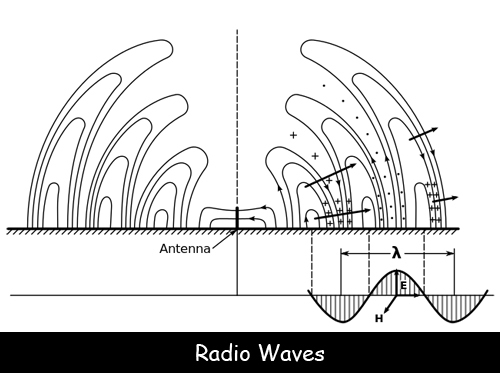 Radio Waves are a type of electromagnetic waves. Many people confuse radio waves with sound waves but both are different. They are considered to be one of the most important inventions. James Clerk Maxwell was the first to predict the existence of these waves. Heinrich Hertz demonstrated radio waves in his lab in 1887. He also has the unit of measurement of radio waves ‘Hertz’ named after him. In 1890’s Guglielmo Marconi created the first practical and usable radio transmitter and receiver. The best-known use of radio waves is for communication like in television, cell phones and radios. They all receive radio waves and convert them to mechanical vibrations in the speaker to create sound waves. These waves have the longest wavelengths in the electromagnetic spectrum. They can range from thousands of metres to 30 cm. Radio waves are the lowest frequency waves in the EM spectrum. They can be used to carry other signals to receivers. Wi-Fi also uses radio waves that are routed through a wireless internet router. The waves have frequencies between 2.4 and 5.8 GHz. The text messages we send to each other from one cell phone to another is also a radio wave. Radio telescopes are used to study space by NASA, the NSF and astronomers. GPS receivers also use these waves. They travel from GPS satellites in orbit that helps to find the GPS location on the earth.